Important! On this page, I'll put tasting notes of tasted wines from different properties, which haven't yet been included in Chateau Profiles, due to not representative amount of tasted wines. 2002 ANGELUS: Big extract, modern style, fruit seems to be well hidden. Needs time to develop. 88+p. Tasted twice - last time in September 2004. Consistent notes. 2001 ANGELUS: Big extract, modern style, ripe and aromatic fruit and long aftertaste. This wine is a big success for the vintage. 91p. Tasted three times - last time in April 2007. Consistent notes. 1990 ANGELUS: Truffles, very distinguished nose with intense flavours, several layers on the palate, great length and structure. Formidable wine with many years to go. 96p. Tasted in March 2010. 1989 ANGELUS: Fabulous stuff with black cherries and truffles. Great complexity and structure, lot of luscious berries, stunning balance and long, soft and swettnesful finish. This was excellent performance! 96p. Tasted in December 2006. 2002 D'AIGUILHE: Aromatic with ripe fruit. Well balanced and with nice length on the palate. Needs time to get round and charming. To enjoy in few years time. 88p. Tasted twice - last time in September 2007. Consistent notes. 1955 AUSONE: Spectacular, truffy and utterly complex wine with great richness, balance and aftertaste. Tasted in March 2015. 97p. 1934 AUSONE: Mature fruit, silky, very delicate and tasty, yet in fine balance but acidity is well-pronounced. Impressive old wine. Tasted in April 2014. 92p. 2002 BASTOR LAMONTAGNE: Fine botrytis, quite light with good acidity to support fruit, attractive and very enjoyable. 88p. Tasted in August 2005. 2001 BASTOR LAMONTAGNE: It's a perfect example of this vintage's fantastic offering with classic style, fabulous botrytis, lot of nuances and long aftertaste. This wine makes me scream and jump of pure joy. Well-deserved 92p. Tasted in September 2004. 1929 BASTOR LAMONTAGNE: This wine showed a fantastic nose of almonds and marzipan, what a intensity and sophisticated touch, still fantastic acidity and lively fruit on the palate, fantastic length and aftertaste lasting more than 1 minute. Heaven! 98p. Tasted in April 2011. 2001 BEAUREGARD: Aromatic, well packed with ripe raspberries and tannin, luscious and with splendid structure. Fine aftertaste. 89p. Tasted three times - last time in August 2006. Consistent notes. 2000 BEAUREGARD: Nice fruit and a bit light. Seems to me that yield per ha at Beauregard was quite high in 2000. Still a good wine, not exciting but correctly made. 88p. Tasted in May 2012. 2002 BEAU-SÉJOUR BECOT: Identical description and score as for 1999. Tasted in September 2003. 1999 BEAU-SÉJOUR BECOT: Aromatic and full-bodied, fine complexity and structure. 91p. Tasted in September 2004. 2000 BRANE CANTENAC: A stunning example of what this vintage was capable of to produce! Powerful and strong wine, intense and aromatic blueberries and black cherries, lot of truffles, strong backbone, rich and complex with long finish. 94p. Tasted in May 2012. 2002 BRANAIRE: Catchy roundness and charm. It drinks very well already. 89-90p. Tasted in August 2006. 2001 BRANAIRE: Delicious, juicy, tight structure, full-bodied with aromatic and tasty berries. Wonderfully balanced, so it 'll keep for 10-15 more years. This is pure class. 93p. Tasted in August 2005. 1999 BRANAIRE: On the elegant side. Round, pleasant and really enjoyable wine. It makes good friends with you. 88p. Tasted in September 2004. 1955 CALON (Montagne-Saint-Emilion): Bought 11 years ago at the property for app. 40 € , so this wine was kept in Calon cellar for 47 years and 11 years in mine. Stand was A/B, cork fragile but the smell of the wine from bottle promised well. I have to say this wine was a revelation with great cherry aroma, silky fruit, well-structured, velvety texture and fine balance, elegance and grace. Not a powerful wine but very enchanting and vivid with no sign of getting too old. 92p. Tasted in December 2012. Tasted again in March 2015 - older and not so impressive. 89p. 1946 CALON SEGUR: Powerful, juicy, strong and quite full-bodied. A very fine effort in the contex of the vintage, which is ranked low. At 60 years of age, this wine was still great to taste. Fine old wine. 90p. Tasted in December 2006. 2002 CAMENSAC: Very similar to TNs on 1999 vintage. 87p. Tasted in September 2010. 2001 CAMENSAC: Slightly less concentrated and less well structured than 1999, A bit rustic and edgy for the moment. 86p. Tasted twice - last time in September 2009. Consistent notes. 1999 CAMENSAC: Nice mature wine, delightfully tasty and perfect to drink now. 87p. Tasted in September 2007. 2000 CANON: Dark red. Very aromatic and very intense nose of raspberries and blueberries. Elegant wine with lot of finesse and fine balance. Very seductive, attractive and tasty. Will keep nicely until 2020. 92p. Tasted in June 2007. 1982 CANON: Tasted in November 2014. 1945 CANON: stunningly fine wine, very much alive and in perfect balance. Very truffy, sophisticated, lot of sweetness, complex and incredibly delightful. Simply awesome wine. 95p. Tasted in December 2013. 2002 CANON-LA-GAFFELIERE: Charming, fine and tasty fruit, good structure. Will be ready soon for consumption. 89p. Tasted twice - last time in August 2005. Consistent notes. 2001 CANON-LA-GAFFELIERE: More elegant and less intense version of 2000. A terrific bottle to share. 91p. Tasted in April 2009. 2000 CANON-LA-GAFFELIERE: Strong, powerful, lot of ripe and intese fruit, excellent structure, great balance, firm aftertaste. Awesome bottle to keep for additional 10-15 years. 94p. Tasted twice - last time in March 2012. Consistent notes. 1990 CANON-LA-GAFFELIERE: Impressive wine with truffles, stunning balance, great structure and silky aftertaste. Stupendous wine. 93p. Tasted in March 2012. 1950 CANON-LA-GAFFELIERE: Stunning old wine, still very much vivid and alive, truffles, great balance and velvety aftertaste. This was a fabulous treat, thanks Count Neipperg! 96p. Tasted in April 2009. 2001 CANTEMERLE: Superbly aromatic, splendid structure and extremely tasty. It is a real crowd pleaser and amazing wine for the vintage. 90p. Tasted twice - last time in August 2006. Consistent notes. 1962 CARBONNIEUX (white): A Bordeaux wine with such fire, energy, body and taste, I thought was a lie. It was a great surprise and once again a crystal clear proof, that white Bordeaux can age as good as white Bourgundy or even better. Formidable wine. 94p. Tasted in December 2007. 2002 CHASSE SPLEEN: Black fruit on the nose, full-bodied. Long lingering taste and well-balanced on the palate. Impressive wine. 90p. Tasted twice - last time in September 2009. Consistent notes. 1999 CHASSE SPLEEN: Aromatic, round, nice fruit, tasty, pleasant and really enjoyable right now. 89p. Tasted twice - last time in September 2007. Consistent notes. 1996 CHASSE SPLEEN: This one is really splendid. Delicious with lot of concentrated and ripe blackcurrants, very tasty, great complexity and impeccably structured. One to keep for another 10-15 years. 92p. Tasted in August 2005. 2002 LA CLEMENCE: Elegant wine, full of sweet fruit and truffles, luscious, tasty and with lingering aftertaste. It provides much pleasure. 89p. Tasted twice - last time in August 2006. Consistent notes. 2001 LA CLEMENCE: Fat and succulent wine, full of sweet fruit and truffles. Deep, well structured, long and nuanced. Stunning wine. 93p. Tasted twice - last time in August 2005. Consistent notes. 1999 LA CLEMENCE – far beyond its peak with prunes and some dryness. 85p. 2002 CLOS DE L'ORATOIRE: Tasty fruit, good length and plenty of charm. 86p. Tasted in August 2005. 2001 CLOS FOURTET: A lot of finesse, sheer elegance, very tasty and with lingering aftertaste. This is a fine effort for the vintage. 89p. Tasted in September 2004. 1999 CLOS FOURTET: LIght but very enjoyable wine with round and tasty fruit. Tasted in August 2005. 1998 CORBIN MICHOTTE: This wine has impressed me already from the barrel with a textbook nose of sweet cherries mixed with chocolate and cocoa powder and incredibly balanced palate of luscious fruit, soft texture and round aftertaste. A classic Saint-Emilion wine made without modern technique gimmicks, not over intelectual and which is a really beautiful example how Right Bank wine should be. The aromas you get on the nose are alone worth all the money you pay for this wine!! Can easily keep for another 10 years. 92p. Tasted 5 times - last time in September 2009. Consistent notes. 1966 CORBIN MICHOTTE: It started very light on the nose and palate and it'd a well-aged light red colour. Soon it started to gain everywhere and after one hour we had a beautifully scented wine with well-preserved cherry fruit, extremely well-balanced, great depth and length, lingering and soft aftertaste. Very precisely made wine in traditional Bordeaux way. Stunning 45 years old wine with several more years to go. 94p. 2003 COS D'ESTOURNEL: Modern style, lot of stuffing, great complexity and big structure. No sign of warm fruit on the palate. Impressive stuff. 97p. 1998 COUTET: Delicate, smooth, fine balance between botrytised flavours (melon, mango and pear) and acidity. Very elegant and tasty. 90p. Tasted in September 2009. 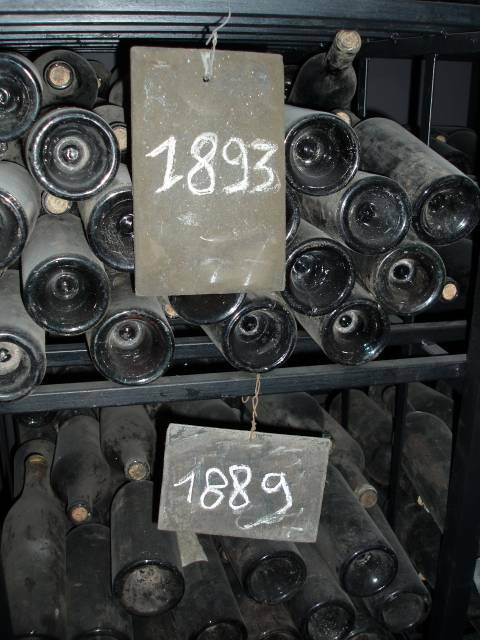 1906 COUTET: 100 years old wine and a wonderful reminder of one of the best vintages ever in Sauternes & Barsac. Still very much alive and what a heavenly stuff. 96p. Tasted in April 2006. 2002 DESTIEUX: Soft, approachable wine with delicate and luscious fruit, round and very pleasant to drink. 89p. Tasted twice - last time in August 2006. Consistent notes. 2001 DESTIEUX: Reminds a lot of 2004, with softer tannins and more approachable. It's really fine quality here. 89p. Tasted twice - last time in September 2007. Consistent notes. 1995 DESTIEUX: Almost ready to drink with slightly dry tannin and warm fruit. 86p. Tasted in September 2004. 2002 DURFORT VIVENS: A pretty and charming wine with nice balance, fine complexity and elegance. 89p. Tasted in September 2003. 2001 DURFORT VIVENS: Nice, round, a bit light wine with slightly jammy fruit. Maturing phase of this wine has really been very fast! 86p. Tasted in August 2006. 1999 DURFORT VIVENS: Quite attractive and well-composed. Nice tasty fruit. 87p. Tasted in September 2004. 1970 L'EGLISE CLINET: Dark red, youngful, tight and impressivly structured. Packed with lush cherries and raspberries, long on the palate and with firm but sweetnesful finish. Wonderful wine, which showed brilliantly at 37 years of age. 95p. Tasted in April 2007. 1985 DE FIEUZAL: This vintage produced excellent white wines in Bordeaux and de Fieuzal is one of them. Classy and refined wine with wonderful aromas of lemon, heather flower and acacia flower. Fatty, full-bodied and impressive wine, which would do any fish dish great honor. 21 years old white Bordeaux and what a beautiful one. 94p. Tasted in December 2006. 2002 FERRIERE: Delicate, sweet fruit, fine structure and well balanced. This is a pretty wine, which can be enjoyed with a big smile. Makes friends very quickly. 90p. Tasted three times - last time in August 2005. Consistent notes. 2001 FERRIERE: Delicate, sweet fruit, light and elegant. It's a bit dry on the palate. 87p. Tasted in September 2004. 2001 LES FIEFS DE LAGRANGE: Delicious, elegant and very charming. Very enjoyable and uncomplicated wine. 86p. Tasted in August 2005. 2001 FIGEAC: Very impressive with splendid structure, elegant and with great finesse. Very seductive wine. 91p. Tasted in April 2010. 1996 FIGEAC: Strong, meaty, splendid balance and length, long aftertaste. Terrific effort for the vintage - 10 years more in the cellar. 92p. Tasted in April 2009. 1967 LA FLEUR PETRUS: A bit of surprise, really. This vintage is said to be a dead-wood in red, but this wine provides quite reasonable drinking with nice truffles and tasty raspberries. Not bad at all and absolutely not the one calling for the priest! 87p. Tasted in June 2008. 2002 FOMBRAUGE red: Confirms with a bang that 2002 vintage isn't that bad as some critics want us to believe. Powerful with ripe (!) and tasty fruit, splendidly composed and balanced, long aftertaste. Surprised by its splendid performance and what a catch. Drink it to wild meat or beef. 92p. Tasted in November 2009. 2000 LE GAY: Lots of blackberries and blueberries, truffles, very concentrated, full-bodied and well-composed. Splendid effort for the vintage. 92p. Tasted in October 2007. 1999 GAZIN - Charming, light, round wine, tasty and ready to drink now. 86p. Tasted in September 2010. 1995 GAZIN - Truffles, round, silky fruit and tannins, very tasty, round and smooth on the aftertaste. Delightful bottle to drink now. 91p. Tasted twice - last time in May 2011. 1989 GAZIN - like 1995. 91p. Tasted in April 2009. 2002 GISCOURS: Well composed with a lot of character. Luscious, ripe fruit, well balanced and strong finish. Keep it for additional 6-8 years. 89p. Tasted three times - last time in August 2005. Consistent notes. 2001 GISCOURS: This wine had a fabulous aromatic nose and it was full-bodied, incredibly well-composed, with luscious fruit and lot of potential. This was a real heartbreaker wine of stunning quality. 93p. Tasted twice - last time in March 2009. Consistent notes. 2000 GISCOURS: It is strong and dense wine with perfectly ripe, fat and creamy fruit (cherries, blackberries and blueberries). Exemplary balance and structure, immensely refined and with splendid depth and length. A delicacy with a vengeance! This wine is extremely well made and showed very clearly, what Giscours can achieve. One to keep for 25 years or more. 95p. Tasted twice - last time in March 2009. Consistent notes. 1999 GISCOURS: It reminded in some way vintage 1997, but with significantly more concentration and body and better structure. This was a really nice wine for the vintage and very round and approachable. Will stay like that until 2010. 89p. Tasted in September 2003. 1998 GISCOURS: Similar a lot to 2002 concerning the style. Fruit had however more sweetness in 1998 and there was more weight and length. Splendid wine, which Can be kept for 10 more years. 90p. Tasted in September 2003. 1997 GISCOURS: The efforts of the new owner did pay off. This wine had an unresistible charm with captivating appeal, silky tannins and round shapes. It went down the throat very smoothly and left you with much pleasure. Definitely a great success for the vintage. It's already drinkable and will stay like that until 2009. 88p. Tasted in September 2003. 1996 GISCOURS: Made before the new owner cleaned out completely in the vineyard and cellars. Jammy and quite forward in maturing phase. Nice sweetness of fruit and length, but this wine lacks both depth and concentration. Quite disappointing for this classic vintage in Bordeaux. Ready to drink. 84p. Tasted in September 2003. 1999 GRAND PUY LACOSTE: A lighter version of 1998, round, charming and already drinkable. 86p. Tasted in September 2010. 1998 GRAND PUY LACOSTE: Fine wine, not quite ready yet. Tasty blackcurrants, fine balance and depth. One to enjoy in the next 6-8 years. 88p. Tasted twice - last time in September 2007. Consistent notes. 1926 GRUAUD LAROSE: Double magnum bottle. Splendid wine, still very much alive, fine length and sweet truffy finish. 94p. Tasted in April 2010. 1918 GRUAUD LAROSE: Magnum bottle. More rustic and not that sweet in fruit. Still a remarkable bottle. 91p. Tasted in April 2010. 2002 GUIRAUD: Very elegant wine with nice botrytis, good acidity, mango and acacia honey flavours. Very enjoyable to drink now. 89p. Tasted in September 2007. 2001 LA GURGUE: It's earthy on the palate with some rough edges, reasonable fruit and nice finish. Needs time to come around. 87p. Tasted in September 2004. 2002 HAUT BAGES LIBERAL: Prunes and cherries, full-bodied wine with great intensity of delicious berries. Rich and with long aftertaste. Stunning wine for the vintage. 92p. Tasted in September 2003. 2001 HAUT BAGES LIBERAL: Another story here. This is a real classy wine with ripe berries, ripe tannin, fine balance and lingering aftertaste. It fully deserves 91p. Tasted twice - last time in August 2006. Consistent notes. 1999 HAUT BAGES LIBERAL: Deliciously round and charming, finesse. Tastes really nice. 87p. Tasted in August 2005. 2003 HAUT BAILLY: Deep red. Both fruit and tannin seemed to be on the dry side with slight touch of heat. It was quite concentrated, earthy and with nice length. 88p. Tasted in August 2006. 1999 HAUT BAILLY: Tannic but seems to be in good balance, strong and full-bodied. Needs time to become softer. 87p. Tasted in August 2005. 1990 HAUT MARBUZET: Hedonistic wine 10 years ago and still tasting gorgeously. Delicious nose of sweet and perfectly ripe blackcurrants, very attractive, exquisite balance, velvety palate, firm fruity aftertaste. Simply delicious to enjoy now as this wine is on its apogeum. Tasted in October 2014. 2001 LABEGORCE: Round, pleasant, nice fruit, fine length and aftertaste. It is very enjoyable now and for the next 3-4 years. 87p. Tasted twice - last time in September 2009. Consistent notes. 1999 LABEGORCE: Round, pleasant, nice fruit, fine length and aftertaste. Very enjoyable now and for the next 3-4 years. 87p. Tasted in August 2005. 2002 LABEGORCE ZEDE: Succulent, robust and quite strong. Not quite a typical wine for Margaux, but well made and in fine balance. 88-89p. Tasted in September 2004. 2002 LAGRANGE: Lot of elegance and finesse, tasty dark berries, superb structure and long finish. It's real steal for the money. 90p. Tasted in November 2007. 2001 LAGRANGE: Classic St.Julien wine with lot of elegance and finesse, ripe red fruit, superb structure and long finish. 87-91p? Tasted twice - last time in November 2007. Not consistent notes. 2000 LAGRANGE : This wine had lot of black cherries, blueberries and blackberries. This aromatic paradise of fruit showed how fantasticly Merlot did in 2000. Very concentrated and impeccably balanced on the palate with strong fat tannin and plenty of cherries and blackcurrants. Long aftertaste. A killer wine. 94p. Tasted in November 2007. 1998 LAGRANGE: Very much like 2002 Lagrange. Aromatic, elegant and tasty. Perfect to drink today. 89p. Tasted in November 2007. 1996 LAGRANGE: This was a massive wine with very pronounced character of C.Sauvignon (mynthe and tobacco leaves), strong, dense and intense palate with stunning balance and persistent aftertaste. 93p. Tasted in November 2007. 1995 LAGRANGE: It resembled a lot of 1996 but with less power and concentration. But once again, great value for the money here. 90p. Tasted in November 2007. 1990 LAGRANGE: This wine appeared not as stunning as I expected. Maybe the bottle I had wasn't in perfect condition. Anyway it turned out as very complex, dense and deep wine with quite jammy flavours. 89p. Tasted in November 2007. 2000 MALARTIC LA GRAVIERE: Very sensual wine with truffles, striking elegance and finesse, perfectly ripe fruit, great balance, depth and length. Great wine for the vintage and it can keep for 15-20 years more from now. 93p. Tasted in May 2012. 2002 MALESCASSE: Light, supple, round and pleasant wine with nice fruit and reasonable length. Useful. 86p. Tasted in September 2004. 2001 MALESCASSE: Better in terms of ripeness of the fruit than 2002. More concentration here. 87p. Tasted in September 2004. 1947 MEYNEY: From magnum. A great wine from legendary vintage, still fresh and lively, intense blackcurrants on the nose and palate, great elegance and persistent aftertaste. Awesome treat. 95p. Tasted in April 2011. 2001 LA MONDOTTE: Very intense, multidimensional, subtle with great depth, lot of nuances, very long finish. Fabulous wine. 94p. Tasted in March 2012. 1998 LA MONDOTTE: Like 2001 but with more concentration and depth here. 95p. Magnifique effort. Tasted in March 2012. 2001 MONTVIEL: Change of winemaker did this wine very good. Very aromatic, fresh flavors, scent of truffles, elegant with fine structure and length. 88p. Tasted in October 2007. 2003 PAVILLON BEL-AIR: Aromatic with nice grip, spicy and earthy fruit. Very good. 86p. Tasted in August 2005. 2001 PETIT VILLAGE: Deep red. It had aromatic and catchy nose of ripe berries, luscious on the palate with finesse and elegance. It tasted better than 2005. 90p. Tasted in August 2006. It showed more age in September 2010 with truffles and tannin starting to take over control in this wine. 88p. 1999 PETIT VILLAGE: Light, straightforward and uninspired wine. 85p. Tasted in September 2004. 1996 PETIT VILLAGE: Surprisingly ready to drink already, raspberry jam, a bit dry on the palate. Should be consumed within 2-3 years. 86p. Tasted in August 2005. 2000 PHELAN SEGUR: It was delicious, hugely aromatic and well-structured with robust approach. 90p. Tasted in August 2006. 1999 PHELAN SEGUR: Ripe fruit, elegant, nice structure with tasty fruit. Round and charming. It's quite pleasant right now. 88p. Tasted in August 2005. 2002 PICHON BARON: It was very impressive wine with superb compexity, superb structure and delicious fruit. 91p. Tasted in September 2003. 2001 PICHON BARON: Perfectly ripe grapes and beautifully aromatic. Chocolate in big quantities, stylish and incredibly tasty. This wine continues to be simply a stunner and a sheer joy. 95p. Tasted four times - last time in in March 2009. Consistent notes. 1996 PICHON BARON: Aromatic and powerful on the nose, deep on the palate with strong structure. Very concentrated and long on the aftertaste. Splendid wine. 95p. Tasted in April 2007. 2002 POUJEAUX: Delicate and aromatic nose, light but very charming, round and attractive on the palate with tasty and luscious fruit. It's very enjoyable wine now. 88p. Tasted in August 2006. 1999 POUJEAUX: Delicate, light, but very charming and attractive. Tasty fruit. Drinks very well already and will do that for another 5-7 years. 86p. Tasted in August 2005. 2001 RAUZAN SEGLA: Aromatic with fragrances of red fruit, elegant with soft tannins and round finish. Pretty tasty wine. 90p. Tasted in June 2007. 2000 RAUZAN SEGLA: Dark red. Very dense aroma of blueberries and blackberries on the nose, really intense. Extremely concentrated, fine balance and long aftertaste. Really superb structure and great depth. Great effort in a great vintage. 94p. Tasted in June 2007. 1996 RAUZAN SEGLA: Robust and strong, well-concentrated. Very much Cabernet Sauvignon wine with exquisite structure and long life. Splendid. 93p. Tasted in June 2007. 1989 RAUZAN SEGLA: Still young, sappy, fine structure, length and aftertaste. This wine's splendid balance and long finish make it quite a nice treat. 90p. Tasted in June 2007. 2001 RIEUSSEC: Incredibly expressive botrytis on the nose, spicy sugar, lot of alcohol, full-bodied with breed, spicy acacia honey, créme brulée. Very long aftertaste. It will keep for many years due to a perfect interplay between stunning sweetness and just as stunning acidity. 96p. Tasted in July 2005. 2002 SMITH HAUT LAFITTE red: Elegant and well-made wine, which offers aromatic and tasty berries, nice smooth tannin and a fine balance. It's fine wine for the vintage. 90p. Tasted twice - last time in Agust 2005. Consistent notes. 2001 SMITH HAUT LAFITTE red: Powerful and well-made wine, which offers aromatic and tasty berries, nice smooth tannin and a fine balance. This wine is a joy to drink. 89p. Tasted twice - last time in in September 2004. Consistent notes. 2001 SMITH HAUT LAFITTE white: Incredibly aromatic, with extremely catching sweetness and roundness. Powerful with splendid acidity and long aftertaste. Delicious. 93p. Tasted twice - last time in in September 2004. Consistent notes. 2000 SMITH HAUT LAFITTE white: This wine was aromatic with pure elegance and great length on the palate, tasty with splendid structure and depth. It's extremely fine effort for the vintage and one to keep for 8-12 years. 91p. Tasted in September 2007. 1982 SOCIANDO MALLET: Dense, black red, incredibly concentrated with glorious blackcurrant fruit, powerful tannins, strong structure and long aftertaste. Awesome wine. 93p. Tasted in December 2007. 2002 SUDUIRAUT: Fine botrytis and sweetness. Very honeyed and refined. Not as powerful as 2001 and 2003, but nevertheless a splendidly crafted wine. 90p. Tasted three times - last time in in September 2007. Consistent notes. 1999 SUDUIRAUT: Fine botrytis, much finesse and balance. Very honeyed and tastes deliciously of apricots. 91p. Tasted twice - last time in March 2010. 2002 DU TERTRE: It provided aromatic and tasty berries, and good length on the palate. 87p. Tasted twice - last time in August 2005. Consistent notes. 2001 DU TERTRE: Aromatic, sophisticated and seductive. It was very classy and very classic wine, which continues its fine form. It fully deserves 92p. Tasted twice - last time in September 2004. Consistent notes. 2000 DU TERTRE: This wine is a real catch for all the money! Dense, superbly concentrated, perfectly ripe blackcurrants, cherries and blackberries, silky tannins, incredibly much finesse and refinement. Very long on the palate. It tasted like a dream. Simply a great wine, which probably is du Tertre's best vintage. Will easily keep until 2025. 92p. Tasted twice - last time in March 2009. Consistent notes. 1999 DU TERTRE: This was a lighter version of 1998, which with its very fruity, charming and round attitude, will quickly win new friends. It was a pleasure to drink, but this wine can stay like that for another 5-7 years. 87p. Tasted in September 2003. 1998 DU TERTRE: Striking change of style here compared with 1997 with much more sweetness, concentration and length. This wine was extremely captivating with delicious blackcurrants and blackberries, splendid balance and exemplary structure. This is tremendous wine to enjoy now and in the next 6-10 years. Well-deserved 91p. Tasted in September 2003. 1997 DU TERTRE: The new owner tried without any luck to convince previous owner, that late harvesting would be beneficial for the wine. That's why du Tertre in this vintage is well charming, elegant and with tasty fruit, but also light and slightly four-squared. It's ready to drink, but can keep all the ingredients together in a couple more years. 85p. Tasted in September 2003. 1996 DU TERTRE: Very perfumed on the nose with ripe and delicate fruit. Deep and elegant wine with concentrated and plump taste, backbone and fine length. Harmonious and very flattering wine. It lacked a bit more of depth and length to be really stunning. Delicious now and in the next 5-8 years. 90p. Tasted in September 2003. 1953 VIEUX CHATEAU CERTAN: Wow, what a nose!! Incredible intensity of truffles on the nose. Lot of truffles, fantastic balance, refinement and depth on the palate. Fantastic finish too. 58 years old wine and what a class act! Unforgetable one. 99p. Tasted in November 2011.